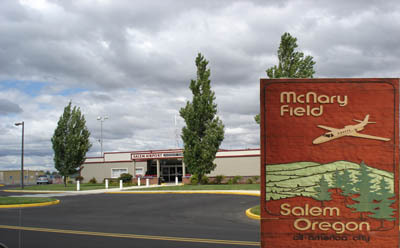 Salem Municipal Airport, also known as McNary Field is located in Oregon's capital city and in the heart of the Willamette Valley. Salem is the third largest city in the State with the Willamette River flowing through it. The airport is located two miles southeast of downtown Salem. The airport code is SLE. For infomation about the Salem Airport, please visit the City of Salem Airport web page. Interested in flying out of Salem and avoiding PDX. A group of Salem business people are working to restore commerical air service back in Salem. Click here to learn more about the effort and how you can help.